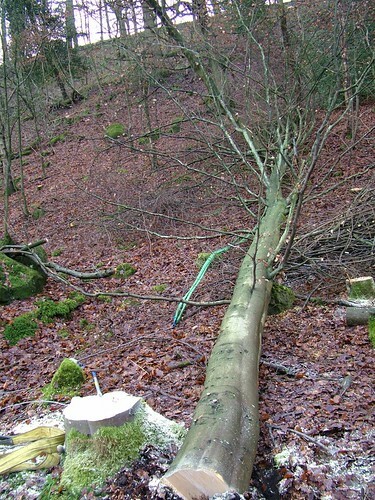 The head forester came down on Tuesday and marked up quite a number of beech, ash and sycamore trees for thinning. These ones are a size bigger than the ones I’ve been working on and some are on a slope. I’ve been looking at ways of getting the logs down to the track using aerial ropeways and chutes, there’s too much to carry manually. I’m considering a simple set up with slings on a tree at top and bottom with a continuous pulley mounted rope carrying a winch to lift the logs off the deck. We’ll see. Bird tables in production now, it’s much quicker and more accurate to turn the roof support columns than whittle them, and so long as I choose reasonably straight branches, they turn with bark left on with no problem. I had an enquiry for one with a free standing base (i.e. standing on a hard surface rather than with the pole sunk in the ground). I think I can manage that OK.
Here’s one of the larger thinnings.